Yes, and for a reason. Firstly, to keep undesirables at bay, and secondly, to add a personal touch. 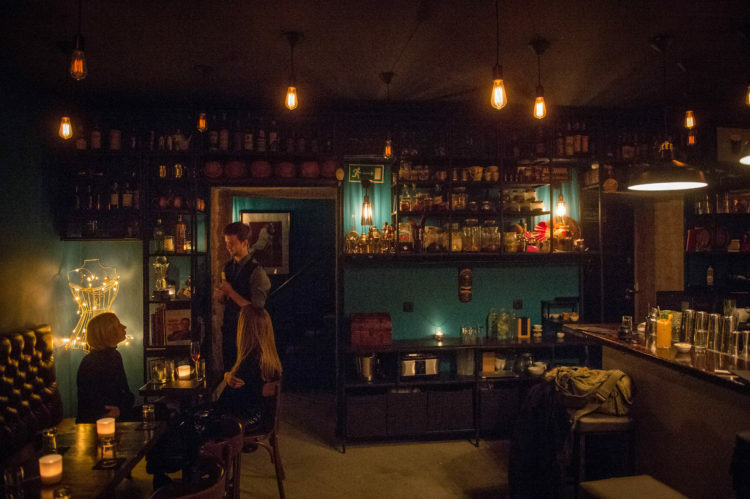 “We’re not a speakeasy,” stresses co-owner Mateusz, “but by keeping the door locked we’re able to meet and greet each guest and also say good bye at the end – it’s all about hospitality.” So there’s you told. Darkness! Okay, it’s hardly black as pitch, but its dark enough to lend the place an atmosphere and intrigue. In terms of footprint, it’s small; or maybe intimate is a better word. 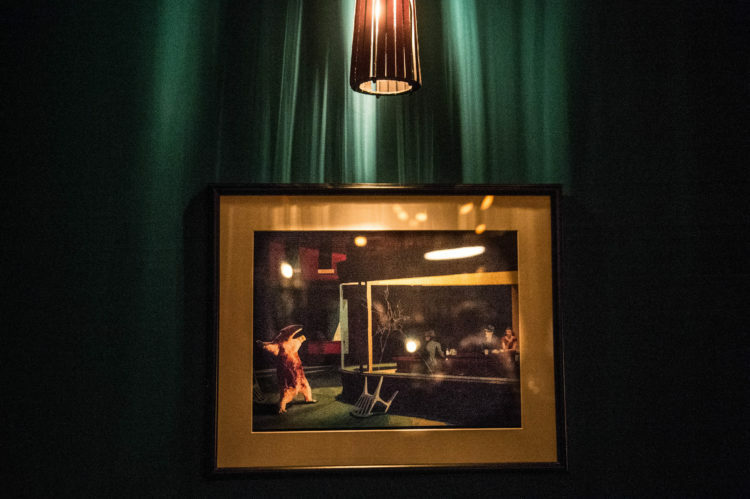 A high ceiling strung with dangling Edison bulbs adds volume, whilst a mezzanine level augments the seating capacity. By way of design, it’s a bit of a puzzle. 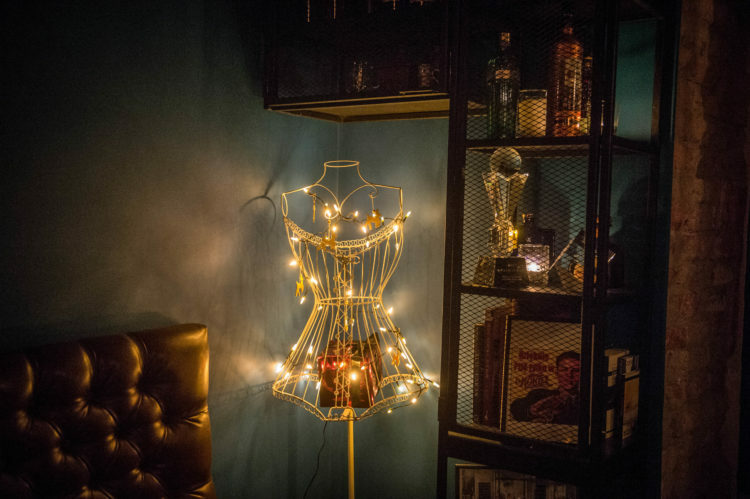 There’s a wire corset strung with fairy lights; soothing cyan-colored wallpaper; and framed vintage posters sprinkled about. These, along with the gleaming strainers and shakers, lend an almost classic, pre-war mood to the overall setting. But it’s not all serious: look about and you’ll see an inflatable pink flamingo resting on the shelves as well as baffling photos of Lynch-esque scenes. There’s a character here, an intensely likable one at that. The pert and pretty are here, so too the well-groomed modern man. Naturally speaking, places like this are always going to attract people on the right side of affluent, but there’s a balance to the crowd that prevents any whiff of snob. 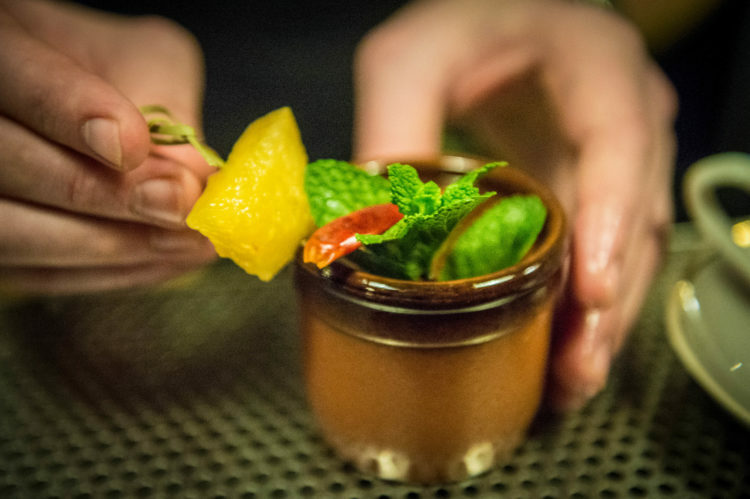 As a bar it feels open-minded, engaging and intelligent, and those are traits that rub off on those present. 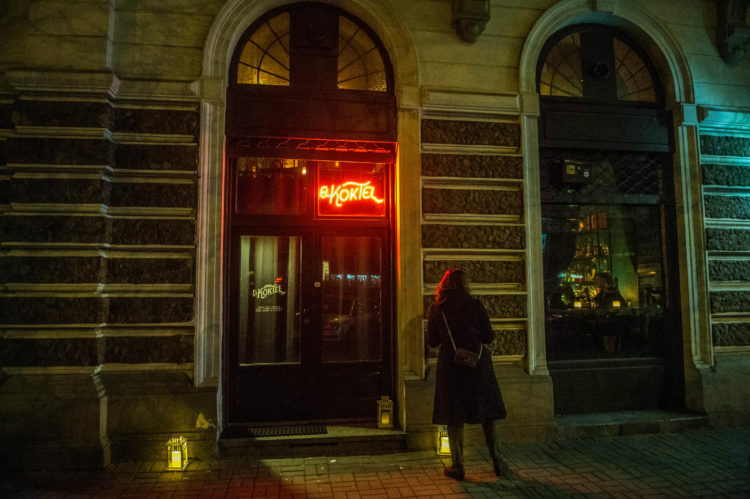 Owners Matuesz and Paweł form the backbone of El Koktel, reaching back on years of experience working in some of Europe’s top bars to pour drinks that leave you on the brink of applause. Certificates and awards testifying to their talent are on display, but your best bet is to see for yourself what they’re capable of doing. Changing every few months, find on the menu forgotten world classics, seasonal specialties with names such as God Save The Quince and El Koktel signatures: from the latter, this Insider adored the Easy Lover (lemon vodka, peach, lemon, mint), but full marks were also earned by the smoking (literally) Out Of The Box (bourbon, Pedro Ximenez sherry, roasted sesame and tamarind). Truth be told, whatever you choose you won’t be disappointed. Wait, haven’t I heard of El Koktel before? Well if you haven’t, you should be taken outside and finished off with a pistol. 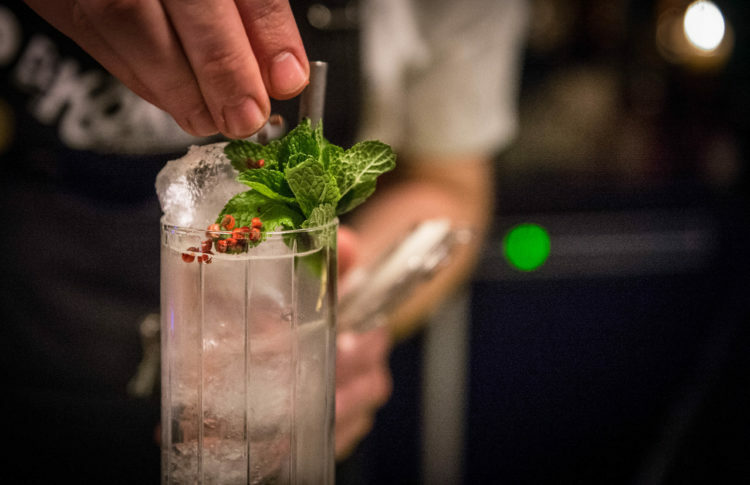 Originating on Poznańska a few years back inside a casual, hidden space not much bigger than a mouse hole, it was there that El Koktel first earned a name for some of the top cocktails in the country. The milieu has changed, the quality hasn’t.